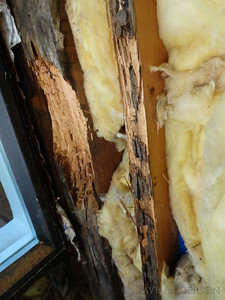 This repair was needed because the owner/builder who put the house together missed a detail. 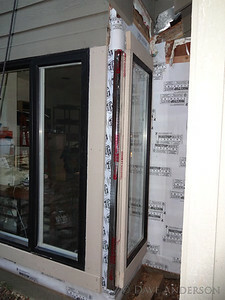 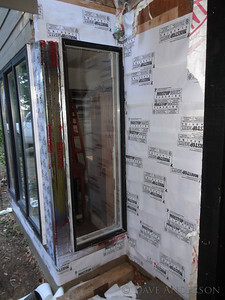 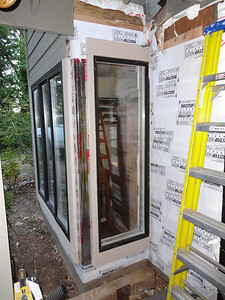 He framed in the porch and put the fascia in place without sealing in the area above this window. 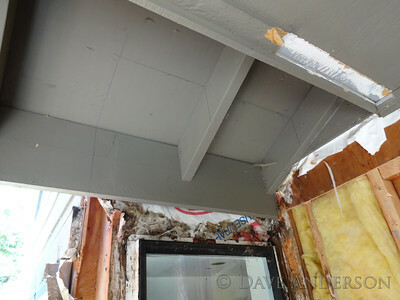 There was an area that should have been covered by siding but since there was not enough room to install that because of the fascia around the porch, he left it. 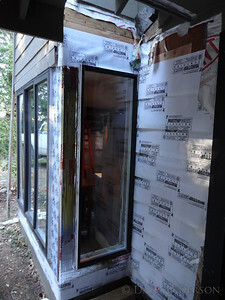 So, every time it rained water would wash down the wall and onto the exposed house wrap above the window, then run down behind the siding and trim. 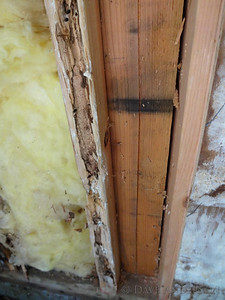 I discovered this several months after installing a new hardwood floor inside this room, when the first rains came and as I was trimming the moisture barrier around the edges to prep for baseboard installation I noticed water in the gap between the hardwood and the wall. 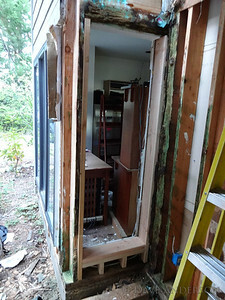 So there I was, early November with the rains starting, and I had to tear one corner off of the house. 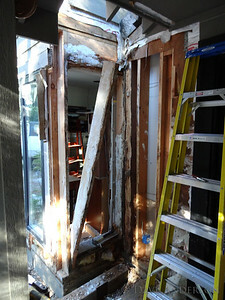 With the siding, trim and sheathing removed the extent of the damage is clear. 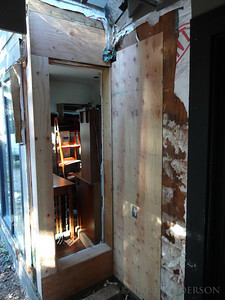 Here I have removed the corner post as well, and installed a box for the GFI receptacle. 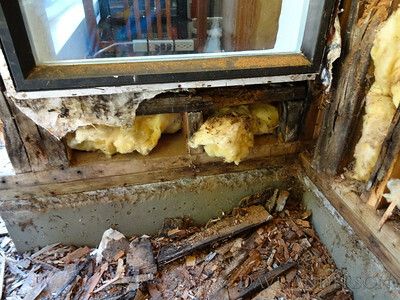 The sill support framing was crumbling away at the slightest touch. 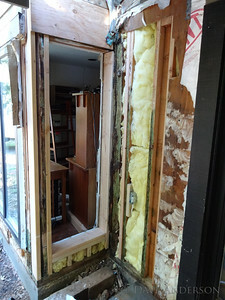 This is where I sliced the sheathing at a stud to provide a place to fasten the new edge. 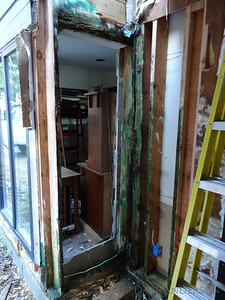 Mold on the right side was surface only. 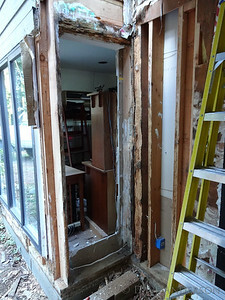 After lightly scraping away the rotted wood the damage is apparent. 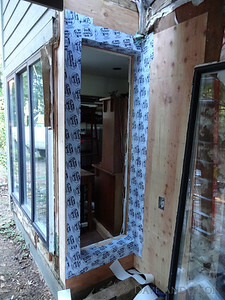 Here I have marked the lines where I needed to cut the porch roof away to access the area needing repair. 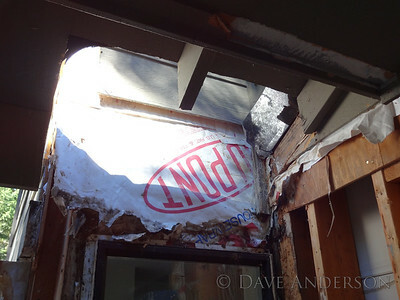 With the roof cut away you can see faint lines where the house wrap was exposed. 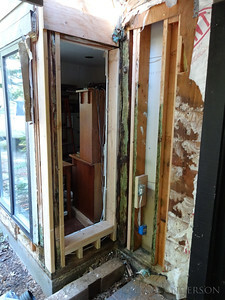 There was a horizontal strip between about the center of the blue letter "o" and the open top of the red letter "u" where water from the wall above or from the roof would run down behind the siding. 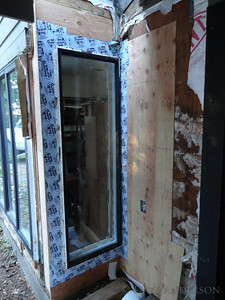 Corner post rebuilt, extra stud sistered in, GFI box installed and new sheathing going on. 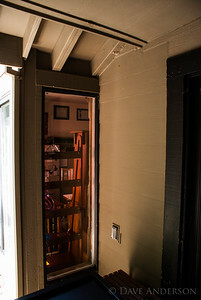 The GFI was essential because I found myself constantly running an extension cord out the front door. 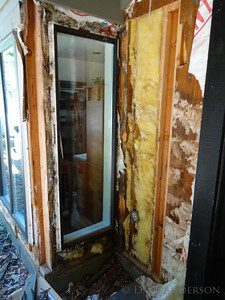 Finished repair. 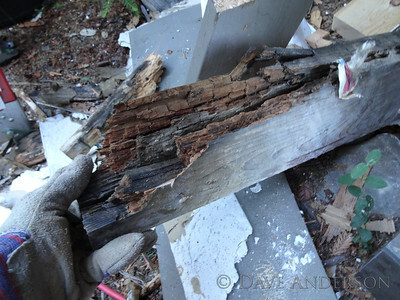 The roof above has a "cricket", a structure to redirect water away from the wall and toward the gutter so this shouldn't happen again.